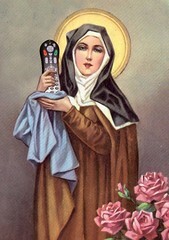 I have long considered St. Augustine and St. Francis my patron saints, however today I am deeply considering the addition of a third saint, The recently cannonized St. Claire for her love and protection of all people who use and depend on TiVo for TV their way. ROFL! You always make me laugh! Thanks! Thanks for your advice on the movie too! Appreciate it! LOL... I just recently learned that Christina: The Astonishing was the Patron Saint of Lunatics, Mental Health Professionals, etc. It would figure that the patron saint with whom I share my name would have such a dubious standing!